Background: Propagation of pathogens has considered an important health care problem due to their resistance against conventional antibiotics. The recent challenge involves the design of functional alternatives such as nanomaterials, used as antibacterial agents. Early stages of antibacterial damage caused by metallic nanoparticles (NPs) were studied by Transmission Electron Microscopy (TEM) and combined Scanning Transmission Electron Microscopy with High Angle Annular Dark Field (STEM-HAADF), aiming to contribute to the elucidation of the primary antibacterial mechanism of metallic NPs. Methods: We analyze the NPs morphology by TEM and their antibacterial activity (AA) with different amounts of Ag and Cu NPs. Cultured P. aeruginosa were interacted with both NPs and processed by TEM imaging to determine NPs adhesion into bacteria wall. Samples were analyzed by combined STEM-HAADF to determine the NPs penetration into bacterium and elemental mapping were done. Results: Both NPs displays AA depending on NPs concentration. TEM images show NPs adhesion on bacterial cells, which produces morphological changes in the structure of the bacteria. STEMHAADF also proves the NPs adhesion and penetration by intracellular localization, detecting Ag/Cu species analyzed by elemental mapping. Moreover, the relative amount of phosphorus (P) and sulfur (S) increases slightly in P. aeruginosa with the presence of NPs. These elements are associated with damaged proteins of the outer cell membrane. Conclusions: Combined microscopy analyses suggest that the early stages of antibacterial damage caused by alteration of bacterial cell wall, and can be considered a powerful tool aiming to understand the primary antibacterial mechanism of NPs. Keywords: Antibacterial damage, metallic nanoparticles, silver, copper, HRTEM, STEM-HAADF. Keywords:Antibacterial damage, metallic nanoparticles, silver, copper, HRTEM, STEM-HAADF. Abstract:Background: Propagation of pathogens has considered an important health care problem due to their resistance against conventional antibiotics. The recent challenge involves the design of functional alternatives such as nanomaterials, used as antibacterial agents. 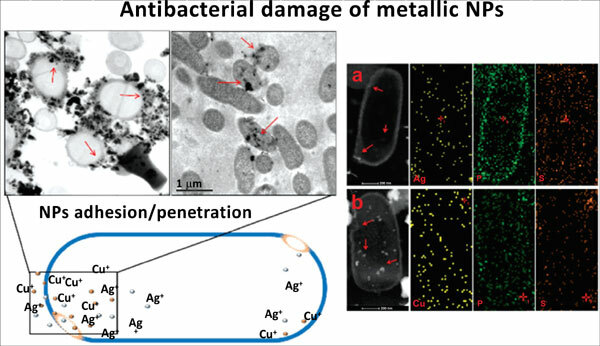 Early stages of antibacterial damage caused by metallic nanoparticles (NPs) were studied by Transmission Electron Microscopy (TEM) and combined Scanning Transmission Electron Microscopy with High Angle Annular Dark Field (STEM-HAADF), aiming to contribute to the elucidation of the primary antibacterial mechanism of metallic NPs.